UGHHH. The last two books in this manga mess me up. The Sailor Star Lights are just so damn sad. This book in particular is mainly tragedy after tragedy after tragedy. But Chibi Chibi finally appears! And we also get to see Chibi Usa in the future, along with her family, actually just living it up, which I think is pretty neat. Neptune cracks me up. Saturn brings me joy. (Ironically, too.) And Usagi—sniffles everywhere. As much as I enjoy Stars, it’s such a quick arc that it can feel rushed and a bit insane (but I also think that has a lot to do with Usagi’s state of mind). For the first half of the volume though, it’s really neat to see how every character has settled into a calm lifestyle, but as usual, that never lasts for long. A new enemy appears…and then the Sailor Star Lights come in. Seiya is a fan favorite, but I really think this volume doesn’t cover enough of Seiya for me to love her just yet. (The next volume is a different story.) In fact, I really love Seiya in this volume just because of Haruka’s reactions. (Uranus.) Haruka in particular is a lot like Seiya, which makes sense considering they are all guardians but in separate sections of the Milky Way. This volume really makes you want to dream up of all the other guardians and possibilities out there…which brings me to my next point. I LOVE that the guardians are the enemies in the final arc of Sailor Moon. I love reading about how all the “lesser” guardians are jealous and want their own planet. I love the idea of these “protectors” finally snapping and wanting to be the ones that are protected. It adds a flawed dynamic to the series I wish Takeuchi could’ve explored for ten volumes. But alas, we have two. Two great ones. (And one left.) I’m going to cry. Onto the last volume! Recommended to: Sailor Moon fans (must read first 10 to understand this one), but you might enjoy Sailor Moon if you love female superheroes, galaxy-themed villains and mythology, and cheesy romance. This volume in particular also deals with severe denial and delusions. Favorite panel: Seiya and Usagi: “I’m sorry. I didn’t…intend to hurt you…” Not only is it emotionally tense but it’s a moment of awakening for Usagi to face her trauma and fears. It’s the breaking point of the arc. 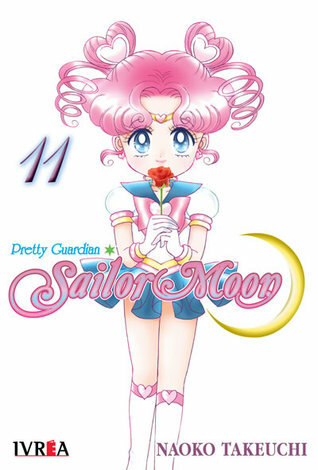 Sign into Goodreads to see if any of your friends have read Sailor Moon, tomo 11.